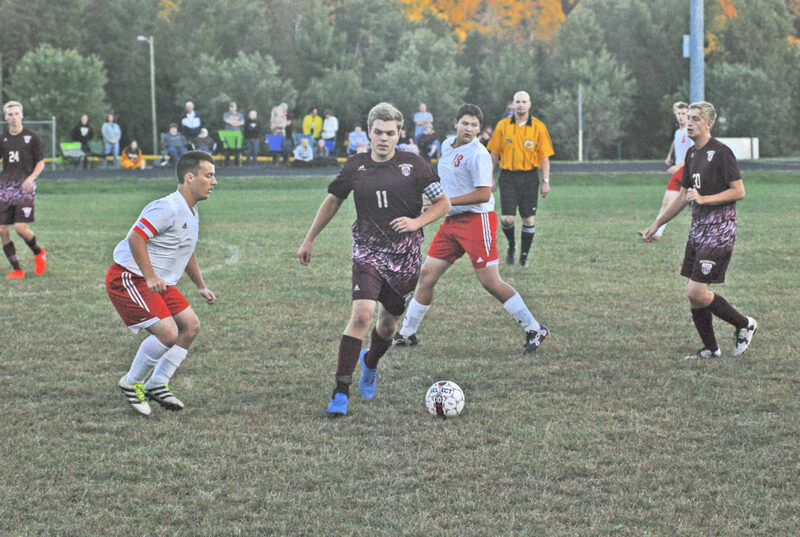 RAVENSWOOD –Williamstown’s combination of excellent defensive organization and speed in attack proved far too much for a game Ravenswood eleven Tuesday night, as the Yellowjackets romped, 6-1. Striker Jonathan Petty and midfielder Josh Folwell struck for a pair of goals apiece, as the ‘Jackets won their tenth match of the season against only two losses and a single draw. Williamstown coach Telma Poole was highly pleased with her side’s performance in all areas of the pitch. “We have good players. We talked before the game about what we wanted to do, and everybody did a really good job,” said Poole. “The communication, the passing; everybody worked together really well,” she summarized. Poole’s game plan centered around using her team’s speed down the flanks, as playing through the middle of Ravenswood coach Todd Murray’s 4-2-3-1 formation would be difficult, and the ‘Jackets executed the strategy well from the start. After some solid Ravenswood possession in the early going, a quick counter down the wing opened the scoring in the sixth minute. Folwell played a good diagonal ball into space for Dakota Hammer running down the left wing. He dribbled to the byline, and arrowed in a low cross for Petty to ram past Devils’ keeper Josh Mize from close range. Sophomore midfielder Boston Caruthers, who was seemingly everywhere in the center of the park all evening for Williamstown, started the move for the second goal. His quick ball over the top down the left wing released Ricardo Gasque, who made a nifty move to lose his defender and pulled the ball back for Hammer. Mize made a fine save to his left to keep the senior striker’s shot out, but the rebound fell kindly for midfielder Isaac Bosgraf, who knocked the ball in at the far post for a 2-0 advantage. Ravenswood managed some constructive play through midfield, but had difficulty establishing themselves in the offensive third. Much of this was down to the disciplined defending of the Yellowjackets, led by senior center back Isaac Brown. Brown was commanding in the air, and demonstrated admirable composure in possession and good distribution at the back. Left back David Wigal also defended well, and caused problems going forward on the overlap. The third goal came in the 18th minute. Petty stepped up to take a dangerous left-wing free kick, and drove the ball in towards the far post. Folwell rose from amidst a crowd of players to meet it, and nodded a well-placed downward header into the net. An apparent Ravenswood own goal was nullified in the 33rd minute by a ‘Jacket foul in the box. Caruthers and Folwell continued to cause panic in the Red Devil defense with their distribution of lofted passes and through balls down the wing, and they combined with each other to make the score 4-0 just before halftime. Caruthers floated a perfectly weighted ball to find Folwell breaking forward to the edge of the penalty box. Although closely marked, the ‘Jackets’ midfield general slid a precise low shot into the far corner from 15 yards. Mize once again had no chance. The second half started with what, for Ravenswood, must have been more of the disspiriting same. Two minutes after the restart, Caruthers dropped another ball over the top, and the speedy Hammer, not for the first time, outran his marker to latch on to it. He once again got to the byline, and stabbed a low cross past Mize to the arriving Petty, who tapped the ball into the center of the goal from point-blank range. The superb Caruthers was the catalyst again for Williamstown’s final goal. His defense-splitting pass this time found Bosgraf, sprinting in 1-on-1. He rounded Mize, who took him down, leaving the referee no choice but to point to the penalty spot. Senior defender Jonathan Dietz stepped up and beat Mize with a firm, low penalty to the keeper’s right. At 6-0, Poole then chose to substitute her entire team, leaving the final fifteen minutes to her youngsters. Red Devil striker Anthony Boggs, who battled hard despite being often isolated in his lone-striker’s role, bagged a consolation goal in the 69th minute. An innocuous looking long ball into the ‘Jacket box was fumbled by the substitute keeper, and Boggs was on hand to pounce, round the goalie, and slide the ball in for 6-1. Ravenswood freshman Clay Tanner hit the bar with a good angled shot afterward, but that proved to be the final margin. Williamstown crosses the Ohio to play Marietta on Thursday, while Belpre travels to Jackson County to visit Ravenswood (4-6-2) on the same day.